The haunting rhyme remembered from every childhood, paired with Charles Keeping’s eerie charcoal illustrations. 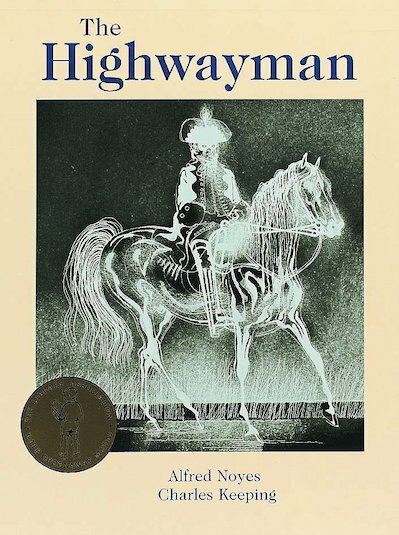 Thrill at the story of the highwayman and his doomed love for Bess, the landlord’s black-eyed daughter! This handsome edition pairs Alfred Noyes’ famous words with pioneering pictures which broke the boundaries of children’s book illustration when they first appeared, winning the Kate Greenaway Medal. Perfect for performance and reading aloud, this is a poem to transfix readers and linger long after it has been read! it is a fantistic book and i recommed it to ages 10 to 14 .